Pet Botanics Mini Training Rewards are an ideal solution to the problem of dogs gaining weight from consuming too many treats during training. Each of these delicious morsels contains only 1.5 calories (1.6 calories for the Grain-Free version), so they can be given repetitively to reinforce behavior -- with no worries that Fido will get flabby. 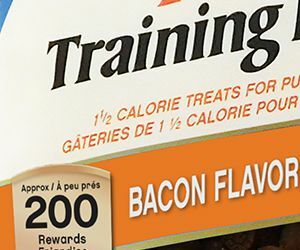 And, because they’re made with real meat as their #1 ingredient, they’re irresistible to dogs, making them a great training motivator that has been recommended by professional trainers nationwide. Canine nutritionists recommend that dogs get no more than 10% of their daily caloric intake from treats – and that includes treats administered during training. 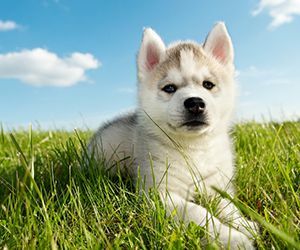 Trainers and pet parents can have a hard time staying within the 10% limit when they’re trying to teach a pup a behavior cue, since this typically requires repetitive rewarding. (See article “Keep Dogs From Putting On Pounds During Training.”) But because Pet Botanics Mini Training Rewards are so low in calories – just 1.5 calories (1.6 calories for the Grain-Free version) – they can be given in greater quantities than high-fat rewards like cheese or even standard dog treats, without exceeding the 10% daily caloric limit. 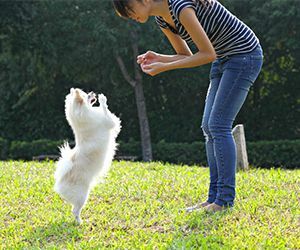 Not only will Pet Botanics Mini Training Rewards help prevent weight gain, but because of their small size, handlers won’t have to worry about the dog getting full and losing interest in the lesson. Pet Botanics Minis are also ideal for challenging training situations that may require a few “extra” rewards. Pet Botanics Mini Training Rewards may be small in size, but they’re big in taste. Made with real pork liver as their #1 ingredient, they have a meaty flavor and aroma that dogs can’t resist. Our Original Pet Botanics Minis are offered in a variety of mouth-watering flavors -- Chicken, Beef, Bacon and Salmon – to satisfy any canine craving. We also offer a Grain-Free version of Pet Botanics Minis, which is available in Chicken, Duck Bacon, and Salmon Flavors. Formulated without grains or glutens, Pet Botanics Grain-Free Minis are ideal for dogs with allergies and sensitive stomachs. Other ingredients you WON’T find in Pet Botanics Grain-Free Minis (or Original Pet Botanics Minis) include Soy, Corn, BHA, BHT Ethoxyquin or Artificial Flavors. What you WILL find in all varieties of Pet Botanics Minis are added Omega fatty acids to promote shiny, healthy coats and skin. 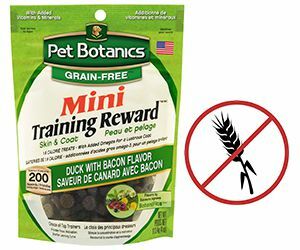 Along with being low in calories, all Pet Botanics Mini Training Rewards varieties have another thing in common: they’re exceptional training tools. Their irresistible taste and aroma will readily Capture a dogs’ attention, Focus her on the task, Motivate her to perform, Reward her for performing: and Shorten the Learning Curve – the five key essentials of training. And because Pet Botanics Training Rewards are packaged in a resealable pouch and have a soft moist texture that won’t crumble, they can be easily transported in a pocket or pouch for convenient training anytime, anywhere.